Mrs. Peacock in the conservatory with a wrench .. hehhehe .. ahem … sorry ** ducks thrown objects … I’m always a bit giddy after I solve a mystery – granted this was already solved, but I still enjoy working thru the clues and getting it to the ‘solved’ point .. I posted earlier about clues 1 thru 3 and went off to do 4 – 6. Between watching some of the games during March Madness I worked on my clues. Clue 4 was another quick one to do … altho I ran into a few problems, if I had checked my original downloaded clues, I would have been fine .. but I did figure it out and solved Clue 4. What I did for this was square these to 3 ½ x 6 ½” – these were flying geese units that had no seam allowance on either side .. I did the 3 ½” first, then lined up my ruler so that the points were at the edges 😀 Voila! Clue 4 solved! Now I did have to frog one block .. In this clue you need to cut the squares in half after you have the rectangles sewn on .. well twit for brains here, cut the wrong way .. saints preserve me!!! I didn’t have any extra of this, so I needed a fix .. simple .. frog the rectangles off and put them on the right way .. Thank God that worked! Otherwise I would have been fit to be tied and then some! 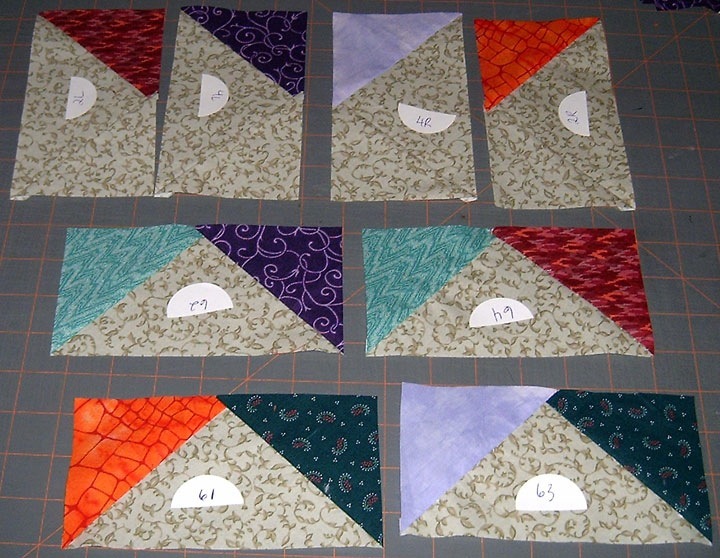 Clue 5 went even easier .. basically it was 3½” HSTs – just 2 of them .. I had this up on my board and was seeing this come together clue by clue .. but if I hadn’t had the final solution, there is no way I would have figured this out until after I finished Clue 6 .. this was a GOOD one 😀 I like it when I can’t guess it ahead of time .. This is also the one spot where I didn’t have enough of the light orange FQ and had to cut one rectangle ..
Clue 6 was the piece de resistance! This was where it all comes together .. I wish I had been able to do this on New Years Day .. but that didn’t happen and I’m just pleased that I did it now! 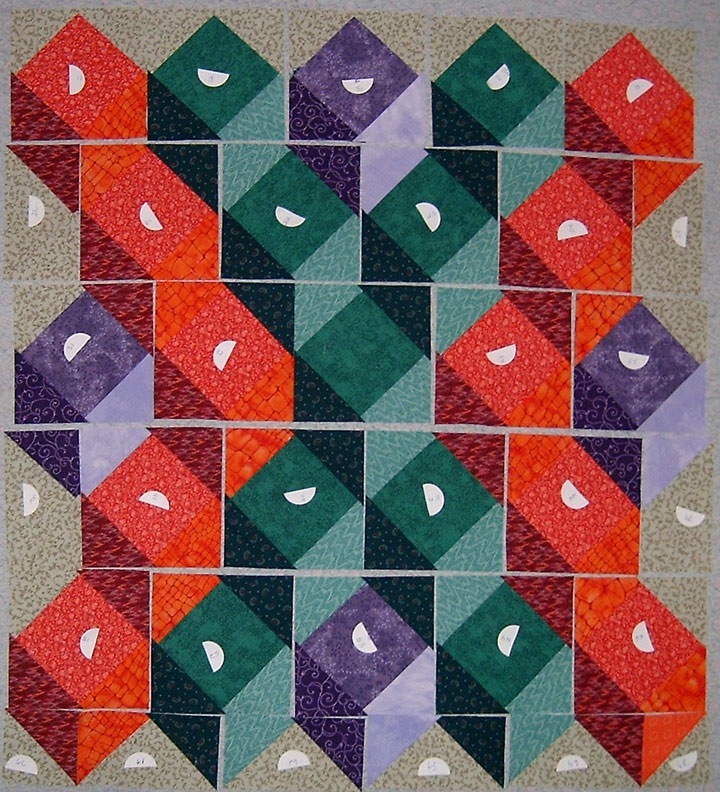 I just love the result of this quilt! And Kris’s suggestion of using stickers to number the squares sure made it easy to keep track of the blocks and to put them in the right order .. AND when I sewed them together it was a blessing! I didn’t have to rip one block apart because it was turned the wrong way .. How cool does this look!! 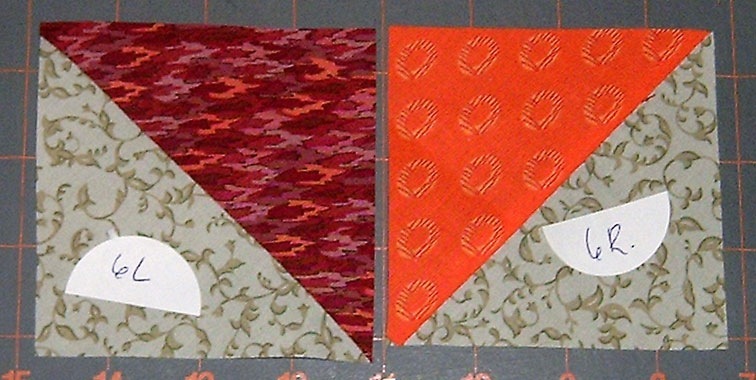 I’ve got all the blocks pieced together and pressed .. altho I do want to take some spray starch and repress it and measure it again .. I’ve a plan for the borders and all those HSTs that were left over from cutting the square in square blocks. But again, I need to be creative, so I’ll be doing some math and drafting tomorrow (today???) to see if I can get it to work out – I pray that it does because this would look really nice if I does .. I think that it’s going to look really nice! Kris thank you for doing this mystery! I really enjoyed this one and will keep my eye open for your next one. 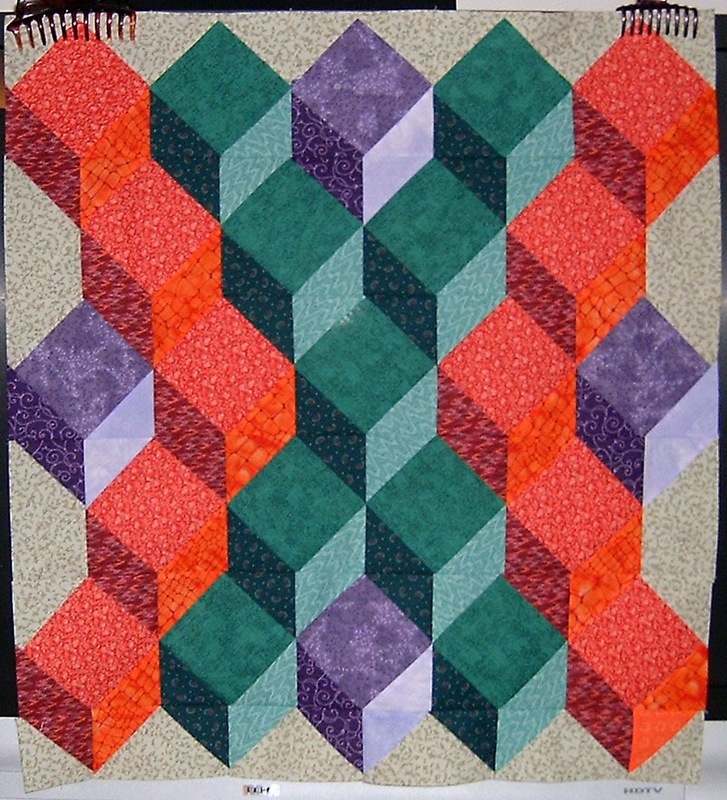 Happy National Quilting Day everyone!! Oh wow that is just lovely. I love the colors. Can’t wait to see what you do with the borders. I’ve been wtching your posts and had no idea where this one was heading. I really like it, especially your color choices! What an excellent surprise this one was! Colours work great together, and it’s sure got a 3-D effect rockin’ the thing. I love the blocks. Your colors are happy colors. I’m working on the star bom by Judy Larquete(sp). I’m slower than Christmas cutting all the strips for shashing. I will post it if I ever get it done. Thank you for sharing your talent. Oh, My mothers name as Grace.